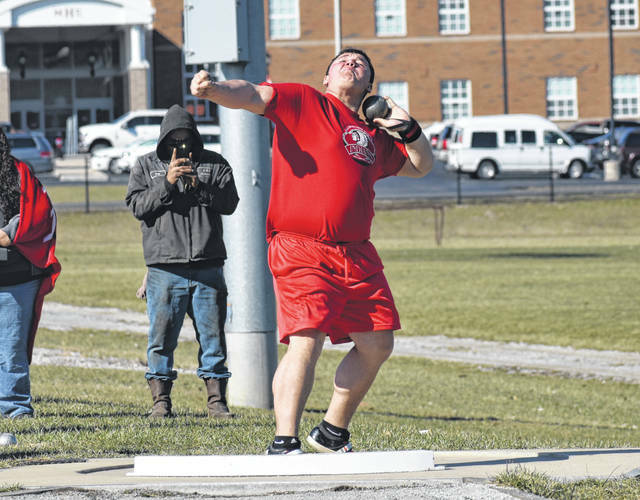 Hillsboro’s Draven Stodgel throws the shot put at Hillsboro High School on Tuesday when the Indians and Lady Indians hosted the Washington Blue Lions and Lady Blue Lions in their first home meet of the season. Hillsboro’s Cierra Lively attempts a high jump Tuesday at Hillsboro High School where the Lady Indians battled the Lady Blue Lions. Hillsboro’s Kai Rickman turns on the jets Tuesday at Hillsboro High School in the boys 100-meter dash. 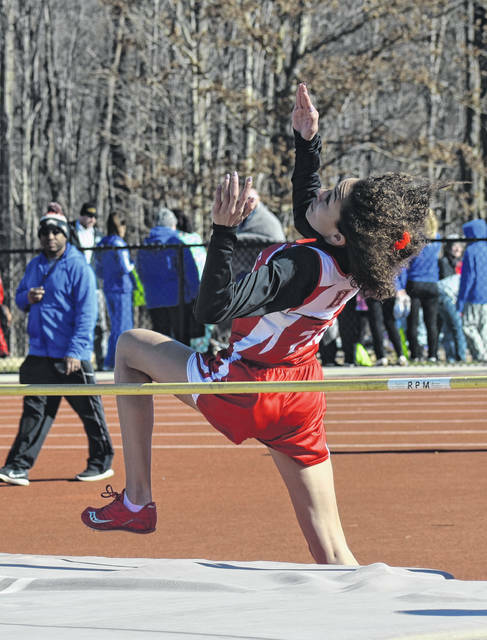 The Hillsboro Indians and Lady Indians Track and field team hosted the Blue Lions and Lady Blue Lions of Washington High School in a dual meet at Hillsboro High School’s Track and Field complex. The Indians and Lady Indians both won the dual meet with the boys winning 94-43 in the team standing and the girls registering a 79-57 win. In girls action Jaeleigh Hart took first place in the girls 100-meter dash and Bre Karnes took second place for the Lady Indians with times of 13.88 and 14.02 seconds respectively. Eden Edenfield placed first in the girls 200-meter dash and Riley Barton took home second place in the event with times of 28.14 and 30.87 seconds respectively. Lady Indians Senior Molly McCreary was first in the girls 800-meter run and finished in a time of 2:55.23 and was second in the girls 1600-meter run with a time of 6:24.55. Keeley Schurman was second in the girls 3200-meter run and finished in a time of 15:07.32. Cierra Lively took first place in the girls 300-meter hurdles and finished in a time of 53.11 seconds. 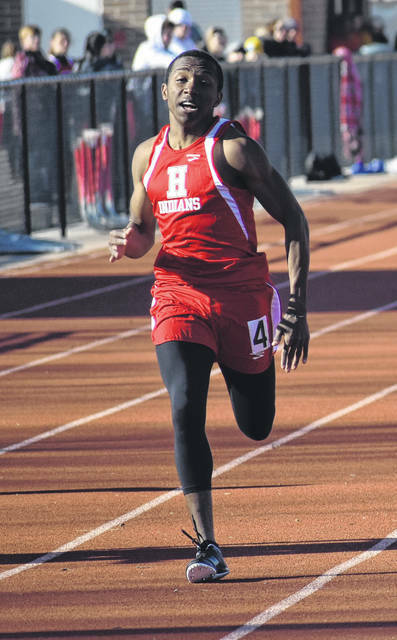 The Hillsoro Lady Indians 4×100-meter realy team of Karnes, Sydney Callahan, Edenfield and Hart took first place with a time of 55.26 and the 4×200-meter relay team, of the same runners, also took first place with a time of 1:57.85. The Lady Indians 4×800-meter relay team of Sami Blair, McCreary, Callahan and Hart took frist place in the event with a time of 4:45. Lively earned first place in the girls high jump with a height of 4’4” and Edenfield took second in the girls pole vault by clearing a height of 7’. Callahan and Barton finished first and third in the girls long jump with distances of 15’1” and 12’ 9.5”. Kelsey Burns and Kenzie Dietrick finsihed one and two in the girls shot put with respective distances of 28’ 6.6” and 27’ 7”. Kailey Dietrick and Ke. Dietrick were first and third in the girls discus throw with distances of 91’ and 82’ 9” respectively. In boys action Kai Rickman and Taylor Lucas were first and second in the boys 100-meter dash with respective times of 12.11 and 12.19 seconds. Rickman and Mark Gallimore were one and two in the boys 200-meter dash and finished with times of 25.05 and 25.32 respectively. In the boys 400-meter dash Landon Weber and Chris stout finished first and second with times of 58.66 and 1:03.27. Bailey Lucarello and Ty Alexander finsihed first and second in the boys 1600-meter run with times of 5:12.83 and 5:14.91 respectively. Lucarello and Ben Sowders were first and second for the Indians in the 3200-meter run with times of 11:27.41 and 12:14.76. The boys 4×200-meter relay team of Tyler Workman, Anthony Richards, Lucas and Rickman earned first place with a time of 1:42.29. In the 4×800-meter relay team of Lucarello, Alex Rensing, Ben Sowders and Alexander took home first place with a time of 9:32.84. Quinn Conlon was first in the boys high jump and cleared a height of 5’ 6”. Draven Stodgel and Deon Burns took first and second place in the boys shot put with distances of 55’ 1” and 48’ 8” respectively; the tandem also placed first and second in the boys discus throw with distances of 144’ 1” and 121’ 2” respectively.